When I was 8 years old, my family and I lived in China (near Shanghai) for two years due to my dad's work. Truly one of the craziest experiences of my life til date. My age is no secret, so this was almost 30 years ago. I have far more and intensive memories of colors, smells, pictures, adventures of those two years than any two years afterwards. One of the things that I learned from the Chinese is that one should drink hot drinks in the heat. By raising the body temperature temporarily while having a hot drink, the body will work to cool itself down ( e.g sweating), and that's the goal, right? They would have hot green tea or just steaming hot water int he summer heat. On the other hand, when you drink cold stuff, your body will work to raise your body temperature. It makes sense, though I find it hard at times to have hot tea while I am already melting in the Dubai summer heat. I have been experimenting with all sorts of hot and cold herbal teas lately. Although I was just telling you to drink something hot in the heat, I will post a cold tea recipe today. I usually drink plain water throughout the day. But sometimes I need something with flavor. As I am not a big fan of juices (to sugary, too thick, little nutritional value), I have been keeping a jug of homemade iced tea in the fridge recently. This tea is flavored with cinnamon and orange, two strong flavors that make this tea taste full and round, so it doesn't need much sugar/honey. A good thirst-quencher at any time of the day. Combine water, orange juice, zest, cinnamon stick and teabags in a pan. Bring to boil, then take off the heat. Stir in honey, then let allow to cool. Strain the liquid and transfer to a jug. Keep in refrigerator until completely cold. 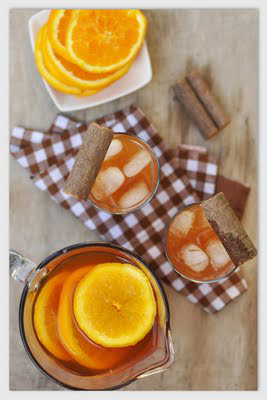 Serve in a jug with slices of orange, a stick of cinnamon and ice cubes.